So you offered to host this Thanksgiving’s feast. Your first time? Done this before, but want to shake things up? Take a deep breath, grab your notebook and let’s workout a game plan! How many people are you having and how can your space accommodate them? Should you serve buffet style, plated dinners or family style? Where will you seat everyone and where would you set the food and drinks? Do any of your guests have food restrictions? Vegetarian, Gluten Free, Vegan? Your kitchen: How big is your oven capacity, what can your pots and pans accommodate and how many place settings and serving pieces do you have? This inventory will affect your menu planning. Time: How much time will you have for prepping food and setting your table? Mostly the weekend before? The day of the holiday? How many dishes would you like to make and are you open to guests contributing to the meal? The Turkey!! So many options today: pre-brined, organic, free range, heirloom, through your grocer, farmer, co-op shares and more. Consider your budget, the number of people you will be feeding and your timing. A 12-pound turkey will feed about 8 people and will obviously take less time to cook than a larger bird. Depending on your oven space, often 2 smaller birds are better than one large turkey. 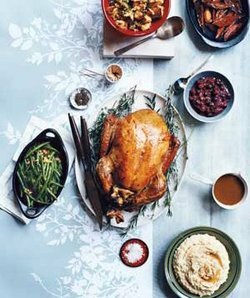 If you have white meat lovers, consider roasting one whole bird and adding additional turkey breast, or adding turkey legs for the dark meat lovers. 2. Side Dishes: Whatever your heart is longing for – Grandma Anne’s mashed potatoes or Aunt Tildi’s sweet yams, there are recipes at your fingertips! Offer a variety of flavors and presentations: creamy pumpkin pie and crunchy pecan pie, molasses cookies and chocolaty bars. Guests can provide the desserts: they can make their own specialty, or offer to pick some up for your table.